Meir Glaser , a Safed resident for over 30 years believes in influencing the world in the spirit of the late Rabbi Shlomo Carlebach. As a college student in Boston University he found himself at a "Shlomo" concert physically and spiritually. That single experience changed his life and caused him to journey on the long and winding road to Judaism. Shlomo's music and magic pulled him inside the circle that Shlomo created and suddenly Meir felt he wanted more. Meir discovered the Hillel House on campus and there he met the Hillel director Rabbi Joseph Polak. Meir became part of the Hillel community and soon found himself not only taking in this new way of life but also giving. Meir learned how to be a hazan as a young boy and Rabbi Polak recognized his talent which led to his leading the Orthodox minyan. Meir also learned to play guitar at 14 and soon after the Shlomo concert he was playing Shlomo songs on the guitar.Meir came to Israel in 1975 to learn in Shapell Yeshiva. After two years he came to Safed , met his wife Hannah and together they built their home and family. Singing and performing in the Carlebach tradition became a natural part of Meir's life. In 1991 Meir helped to revive the Beirav Synagogue and a few years later began to pray every Shabbat using Shlomo's tunes to the services. With his partner Shmuel Polsky they made Beirav into an icon where hundreds of people flowed through this little shul's doors every week. 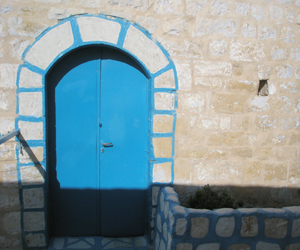 Today Meir prays in the House of Love and Prayer on Safed's main street opposite Bank Hapoalim and has founded the Path of the Heart – The Tzfat Experience which plans coordinates and runs a wide variety of exciting spiritual adventures for families and groups. When Shlomo prayed it had to be with song. Prayer and music when merged into one create the language of the soul. It is the way the soul can be expressed. It is the way the inner you can be heard. Through the years Meir has led Shlomo minyans all over Israel and in the United States when he toured with his duo Shamayim. For him it is the only way to really pray. He always says that the difference between a Carlebach hazan and any other is that a Carlebacher succeeds when the WHOLE congregation joins in the prayers in song and dance. The hazan is just a catalyst to get every one involved. Meir invites you to contact him for a wide variety of Carlebach related experiences- tours, music, Carlebach Shabbat, bar/bat mitzvah and more.